It is a debate that goes back nearly 500 years and continues today. Does the Bible teach Calvinism or Arminianism; synergism or monergism, the free will of man or the sovereign decree of God? At the heart of the debate is one central question: what is the ultimate determining factor in salvation: God’s sovereign will or man’s free will? In this article we will briefly compare the two theologies, consider their biblical arguments, and see which of the two is faithful to the text of Scripture. We’ll begin with definitions, and then work our way through the classic 5 disputed points. Calvinism was named after the French/Swiss reformer John Calvin (1509-1564). Calvin was massively influential and his reformed teachings spread quickly around Europe. His writings (Bible commentaries and The Institutes of the Christian Religion) are still widely influential in the Christian church, especially among Reformed churches. Much of what we call Calvinism was defined after Calvin’s death. Controversy over Calvin’s theology (and that of his followers) emerged because Jacob Arminius and his followers rejected Calvin’s teachings. It was at the Synod of Dort (1618-1619), in response to specific Arminian disagreements, that the five points of Calvinism were defined and articulated. Today, many modern pastors and theologians around the world espouse and vigorously defend Calvinism (though not everyone is comfortable with the term Calvinism, some prefer Reformed Theology, or simply, The Doctrines of Grace). Prominent recent pastors/teachers/theologians include Abraham Kuyper, R.C. Sproul, John MacArthur, John Piper, Philip Hughes, Kevin DeYoung, Michael Horton and Albert Mohler. Arminianism is named after the aforementioned Jacob Arminius (1560-1609). Arminius was a student of Theadore Beza (Calvin’s immediate successor) and became a pastor and then a professor of theology. Arminius began as a Calvinist, and gradually came to reject certain tenets of Calvin’s teachings. As a result, controversy spread around Europe. In 1610, followers of Arminius penned a document called The Remonstrance, which became the formal and clearest protest against Calvinism. This led directly to the Synod of Dort, during which the doctrines of Calvinism were articulated. The five points of Calvinism were a direct response to the five objections of the Remonstrants. Today, there are many who consider themselves Arminians or who otherwise reject Calvinism. Prominent recent pastors/teachers/theologians include C.S. Lewis, Clark Pinnock, Billy Graham, Norman Geisler, and Roger Olson. 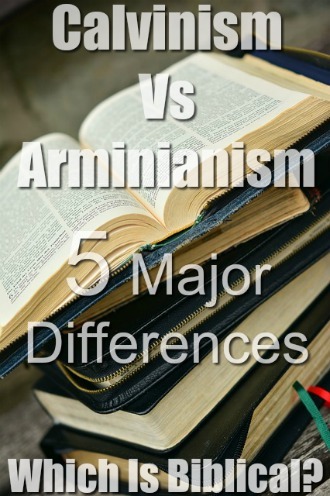 There are 5 major points of disagreement between Calvinists and Arminians. They are 1) the extent of man’s depravity, 2) whether election is conditional, 3) the extent of Christ’s atonement, 4) the nature of God’s grace and 5) whether Christians will/must persevere in the faith. We will briefly survey these five points of disagreement and consider what the Scriptures teach about these. Many Calvinists refer to man’s depravity as Total Depravity or Total Inability. Calvinists believe that the depravity of man, as a result of the fall of man in the Garden of Eden, renders man totally unable to come to God. Sinful man is dead in sin, slaves of sin, in persistent rebellion against God and enemies of God. Left to themselves, people are unable to move towards God. This does not mean that unregenerate people cannot do good acts, or that all people act as badly as they could act. It simply means they are unwilling and unable to return to God, and nothing they can do can merit God’s favor. Arminians would agree to an extent with this view. In the Remonstrance (article 3) they argued for what they called Natural Inability which is similar to the Calvinistic doctrine. But in article 4, they proposed the remedy for this inability was “prevenient grace”. This is a preparing grace from God and is dispensed to all mankind, overcoming man’s natural inability. So man is naturally unable to come to God, but because of God’s prevenient grace all people can now freely choose God. The Scriptures overwhelmingly affirm that, outside of Christ, man is totally depraved, dead in his sin, slaves to sin, and unable to save himself. Romans 1-3 and Ephesians 2 (et.al) make the case emphatically and without qualification. Further, there is no convincing biblical support that God has granted all mankind a preparing grace to overcome this inability. Calvinists believe that, because man is unable to initiate a saving response to God, man is only saved because election. That is, God elects people on the basis of His sovereign will for reasons in Himself, with no contributing condition from man himself. It is an unconditional act of grace. God sovereignly chose, before the foundation of the world, those who would be saved by His grace, and brought to repentance and faith in Christ. Arminians believe that God’s election is conditioned upon God’s foreknowledge. That is, God elected those whom He knew beforehand would believe in Him. Election is based, not on the sovereign will of God, but ultimately upon man’s response to God. John 3, Ephesians 1, and Romans 9, teach clearly that God’s election is not conditional, nor based on any response to God from man. Romans 9:16, for example, says So then [God’s purpose of election] depends not on human will or exertion, but on God, who has mercy. Further, the Arminian understanding of foreknowledge is problematic. God’s foreknowing people is not merely passive knowledge about the decisions people would make in the future. It is an action God takes beforehand. This is clear, especially from Romans 8:29. God foreknew all who would ultimately be glorified. Since God knows all things about all people of all time, this must mean more than merely knowing things beforehand. This is an active foreknowing, that determines a certain outcome; namely salvation. Calvinists argue that Jesus’ death on the cross effectively atoned (or propitiated) for the sin of all those who would trust in Christ. That is, that Christ’s atonement was fully effective for all who believe. Most Calvinists argue that the atonement is sufficient for all, though effective for only the elect (i.e., effective for all who have faith in Christ). Arminians argue that Jesus’ death on the cross potentially atoned for the sin of all mankind but is only applied to an individual by faith. Thus, those who perish in unbelief will be punished for their own sin, even though Christ paid for their sin. In the case of those who perish, the atonement was ineffective. Jesus taught that the Good Shepherd lays down his life for His sheep. There are many passages which speak of God’s love for the world, and in 1 John 2:2, it says that Jesus is the propitiation for the sins of the whole world. But Calvinists argue convincingly that these passages do not suggest that Christ’s atonement is for all persons without exception, but for all people without distinction. That is, that Christ died for the sins of people from all nations and people groups, and not only for the Jews. Yet, His atonement is effectual in the sense that it actually covers the sins of all the elect. Most Calvinists teach that the gospel offer is genuinely to all, even though the atonement is particularly for the elect. Calvinists hold that God’s saving grace overcomes, in His elect, the resistance inherent in all of fallen mankind. They do not mean that God drags people, kicking and screaming, to Himself against their will. They mean that God intervenes in a person’s life in such a way as to overcome all natural resistance to God, so that they come willingly by faith to Him. Arminians reject this and insist that God’s grace can be resisted. They object that the Calvinist view reduces mankind to robots with no genuine will (i.e., they argue for Free Will). The Apostle Paul wrote that no one seeks after God (Romans 3:11). And Jesus taught that none can come to faith in Christ unless God draws him (John 6:44). Further, Jesus said that everyone the Father gives Him will come to Him. All of these passages and many more suggest that God’s grace is, indeed, irresistible (in the sense explained above). Calvinists believe that all true Christians will persevere in their faith to the end. They will never stop believing. Calvinists affirm that God is the ultimate cause for this perseverance, and that he uses many means (support from the body of Christ, the Word of God preached and affirmed and believed, warning passages in the Bible to not fall away, etc.) to keep a Christian persevering in their faith until the end. Hebrews 3:14 says, For we have come to share in Christ, if indeed we hold our original confidence firm to the end. This clearly means that if we do not hold our original confidence firm to the end, then we have not come to share in Christ now. One who has genuinely shared in Christ will hold firm. Additionally, Romans 8:29-30 has been called the “unbreakable chain of salvation” and indeed it seems to be an unbreakable chain. The doctrine of perseverance is clearly affirmed by Scripture (these passages, and many more). There are many forceful and compelling philosophical arguments against Calvinism. However, the witness of Scripture is just as forceful and compelling in favor of Calvinism. Specifically, the Scriptures are forceful and compelling in their case for a God who is sovereign over all things, including salvation. That God elects for reasons in Himself, and shows mercy on whom He will show mercy. That doctrine does not render man’s will invalid. It simply affirms God’s will as ultimate and decisive in Salvation. And, at the end of the day, Christians should rejoice that this is so. Left to ourselves – left to our “free will” none of us would chose Christ, or see Him and His gospel as compelling. Aptly are these doctrines named; they are the doctrines of grace. How Do I Know What My Gifts Are? Previous: Does God Change His Mind In The Bible?